Alpert Schreyer features an office in California, Maryland. From here, we handle personal injury and criminal defense cases for individuals throughout the state and Washington, D.C. Our lawyers take an aggressive approach to these cases, because we know that your future is at stake. While negotiation skills are critical, we are always trial-ready. We will go the distance to fight for your rights. Our attorneys handle all criminal defense matters. We defend against all misdemeanor and felony charges in state and federal court. Whether you have been accused of drunk driving, a drug charge, a violent crime or any other offense, you can be confident when you have our decades of experience on your side. Our attorneys are prepared for any challenge, and have handled many high-profile cases over the years for people in California, Maryland, and beyond. We represent victims of negligence of all kinds. Have you or a loved one been in a car accident or any other type of accident? Does your case involve a brain injury, back injury or any other type of serious injury? You can benefit from our decades of experience. Our lawyers have recovered many millions of dollars for people like you. We have handled many noteworthy cases, including the Fort Totten Metro train crash and Accokeek drag race crash. 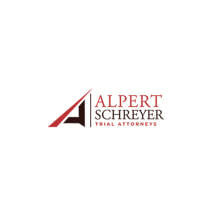 Alpert Schreyer is a law firm with a great depth of trial and litigation experience. We have built our reputation in trials against large insurance companies, governmental agencies, state prosecutors, local, national and multinational corporations. We hear about car crashes all of the time. However, no one really ever expects to be involved in an accident themselves. Doctors and healthcare providers go through years of schooling and extensive training to be able to work competently in their field. Slip and fall accidents occur primarily on someone's property and are categorized in the area of premises liability.